I've been taking advantage of my final few summer days and have managed to finish up the top of my latest quilt, and I really like how it is turning out! 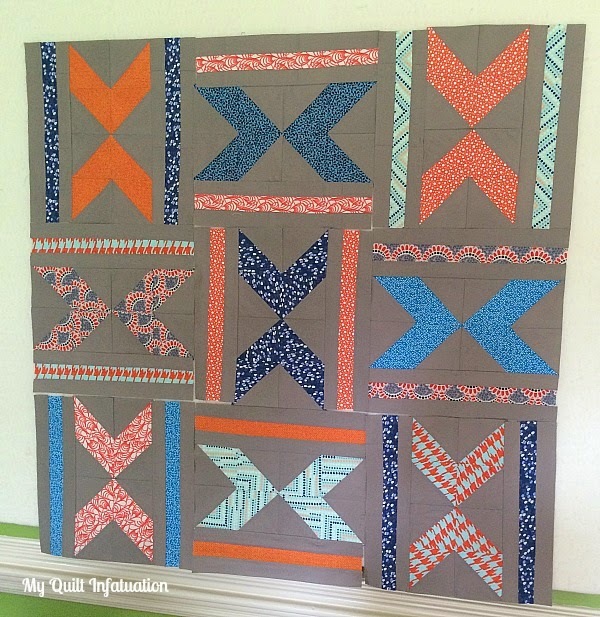 I worried about the darker background (Kona Pewter) making it look too heavy, but I think the blue and orange fabrics just pop right out against it, and that keeps it fun! 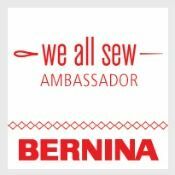 Welcome to Needle and Thread Thursday, friends! 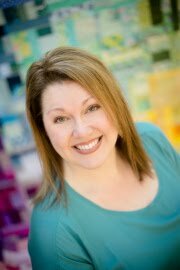 I am so excited to finally be able to let you in on a secret that I've kept for a loooong time. 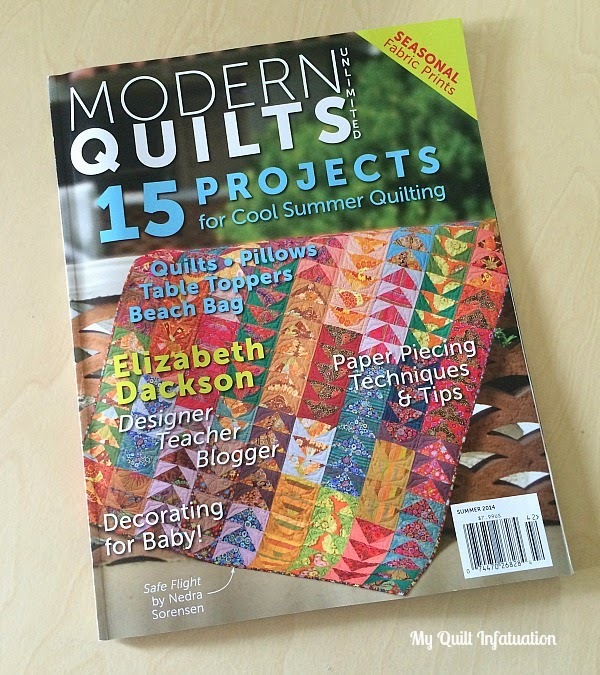 One of my designs is in the latest issue of Modern Quilts Unlimited magazine! It was just released on Friday, and I got my copy in the mail yesterday! 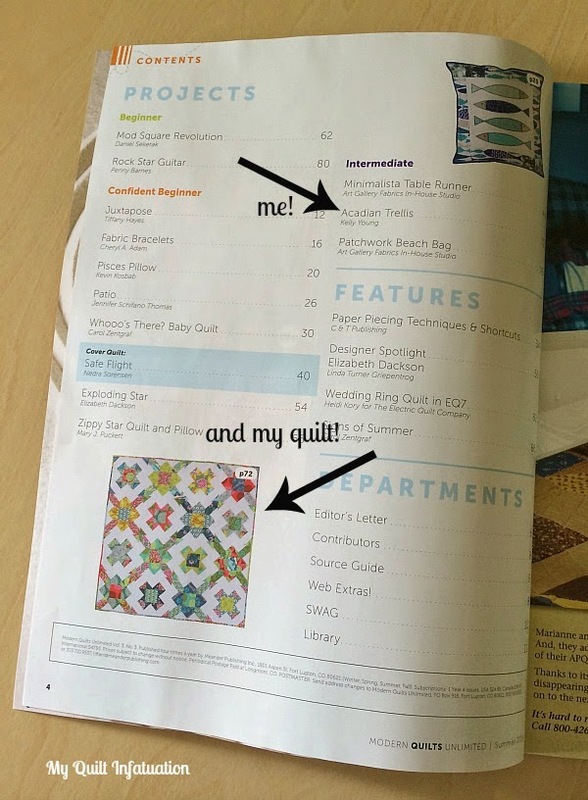 I designed the quilt last November, and made it in February, so finally seeing it in print is so rewarding! 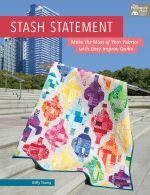 My quilt is even pictured right there in the table of contents! This is such a thrill for me. 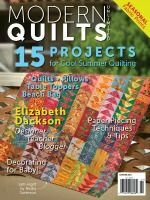 Even though I have had quilts featured in a couple of other magazines, this is the first full pattern that I've had published. 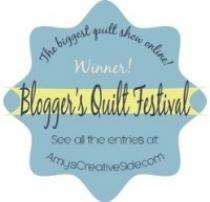 I had to send the quilt to them to have it photographed and I haven't received it back yet. You can bet that when I get it back though, I will be sure to do a photo shoot of my own! Also, I have finally gotten my sewjo back and have been working on a quilt that I sketched out months ago; I just haven't had the chance to make it until now. I'm planning to write a pattern for this one as soon as I finish it. I'm hoping to get this one finished up before my summer vacation comes to a close, but since that only leaves the rest of this week, it may or may not get done. 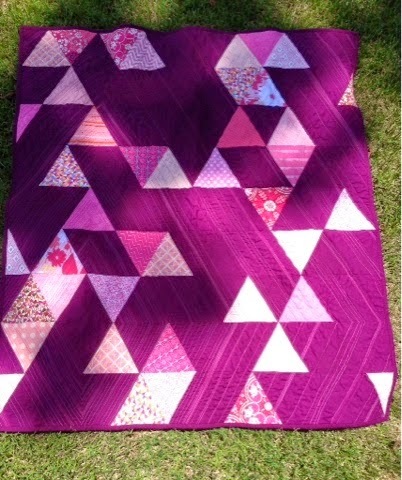 and A Note to Follow Sew shared this simple, but lovely purple patchwork quilt! 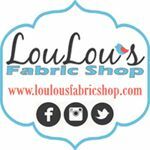 Time to show off what you've got going on in your sewing space! Happy Thursday, friends! 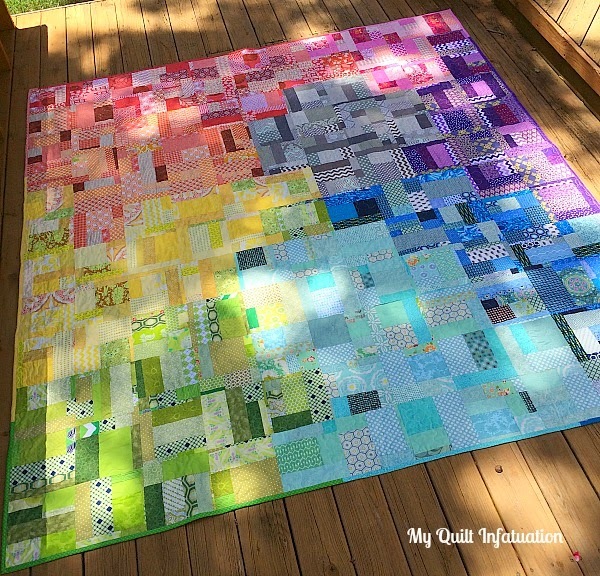 I finished my Shattered Rainbow quilt last night and posted about it earlier today. I love it so much that I thought it needed its own post, so if you missed it, check it out HERE. Here's a peek though! Last week's party was awesome! Check out a few of the eye-catching highlights! 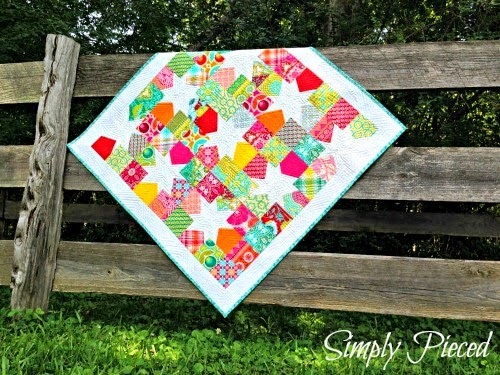 Janet at Simply Pieced linked up this beautiful baby quilt. The photos of this one are gorgeous! 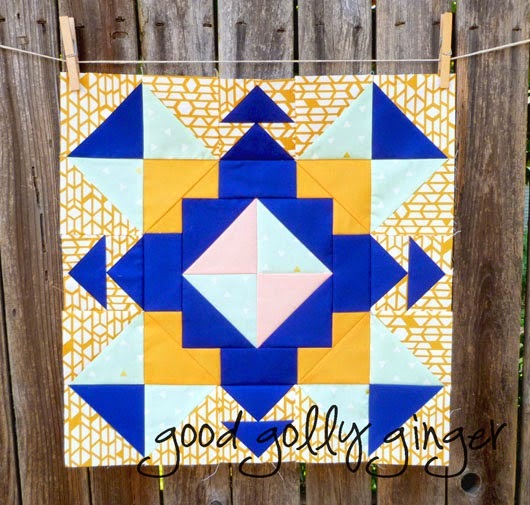 Paula, The Sassy Quilter's Cracker Jack quilt is fantastic. 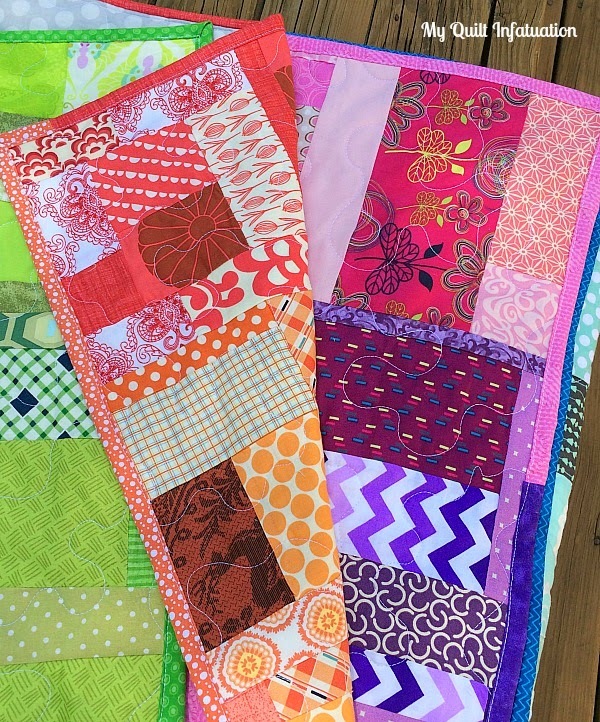 Beautiful colors and quilting! and Elise at Lovelea Designs showed off her Milky Way Medallion quilt. The colors against the black are so striking! 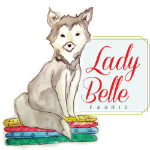 Ladies, feel free to grab a feature button for your sidebar if you'd like! Time to link up! 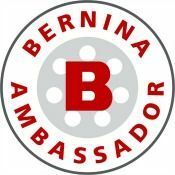 I love seeing what you share each and every week! I put the last stitch in the binding of my rainbow quilt last night, and I am so in love with it! If I could, I would have taken twenty photos of it! That's the bummer of making a queen sized quilt though, it's so big that there are only so many ways to photograph it. Adding to the difficulty was the fact that after several straight days of beautiful sunshine, it poured down rain for exactly fifteen minutes last night, so the grass was still a little bit wet this morning. Glad the deck dried more quickly! 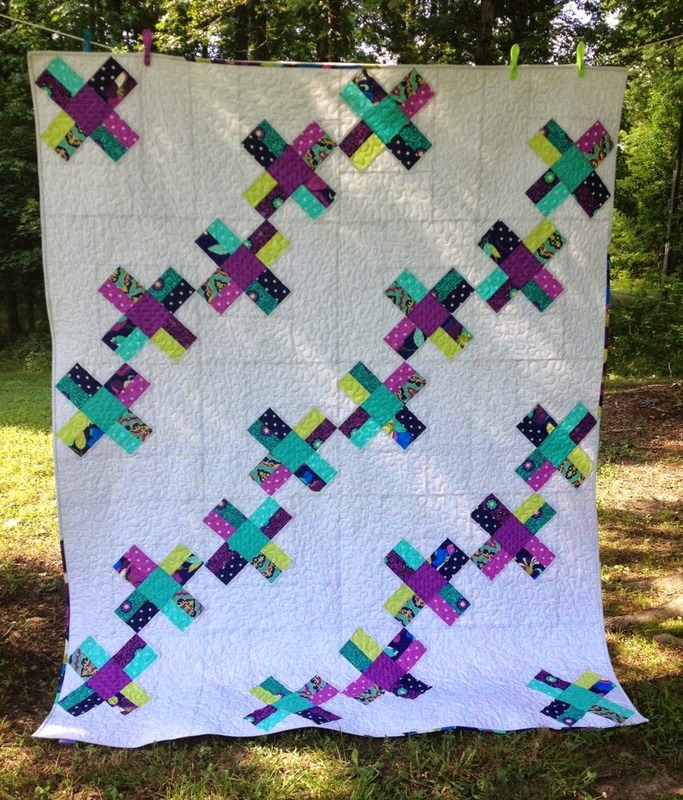 To make the quilt, I used my Improv Piecing technique. 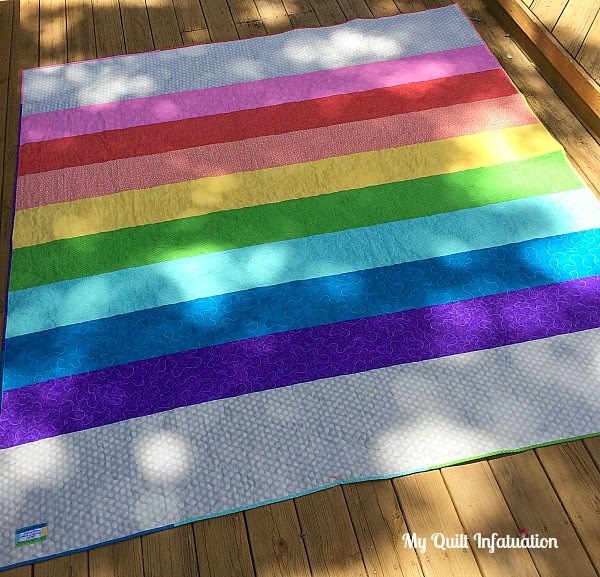 I used the same process last summer when I made Serendipity, and since making that quilt with its scattered explosion of color, I knew I wanted to make a rainbow/color wheel quilt with the same style. I use so many scraps in my quilt backings, that very few get put into my scrap jars, which really is a good thing for me. So, it just took some time for me to build up enough scraps for it. The quilt is so huge though, a whopping 88" x 96" queen, I'm thinking that I may have saved up too many! 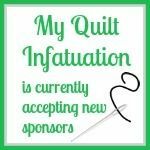 Apparently, I accumulate enough scraps for one queen sized scrap quilt per year. 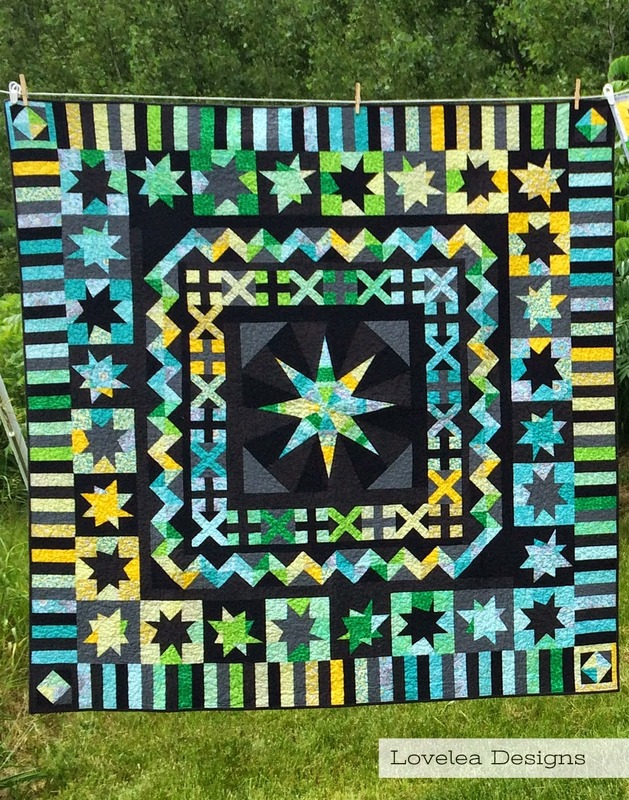 I've named this one Shattered Rainbow, and the biggest difference between this quilt and Serendipity (other than the obvious color placement), is that I made 8 inch finished blocks on this quilt instead of 12 inch. 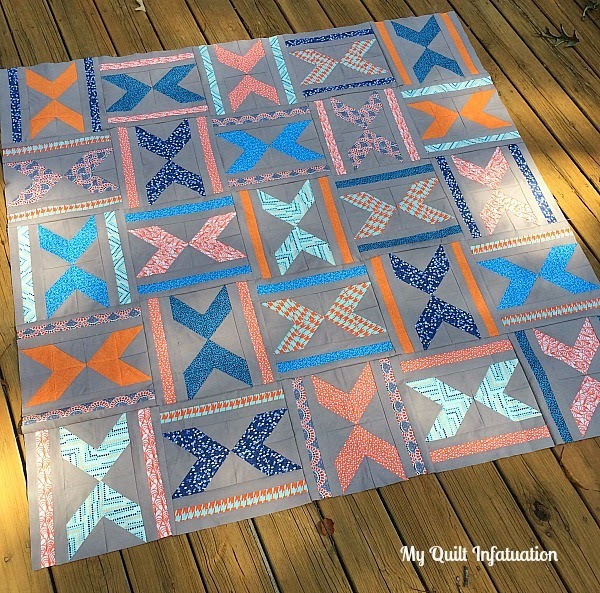 Since I wanted to be able to blend the colors gradually around the quilt, smaller blocks worked better. 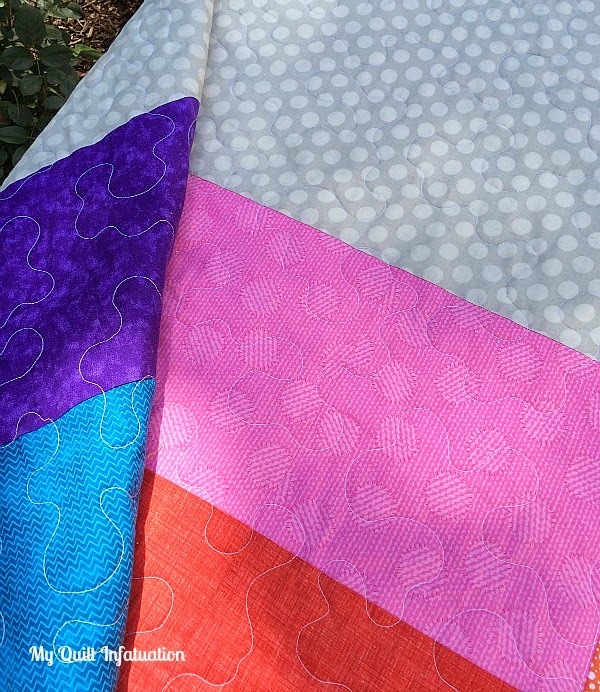 On the back, I created a wide rainbow bordered by this awesome polkadot in two soft shades of gray. I like that the gray dot looks very dreamy and cloud like- the perfect place for a rainbow! One of the things I like best about this quilt is the scrappy binding. Instead of choosing a single color, or randomly sewing strips together for the binding, I actually planned it out, which is something I've never done before. Each color section has binding that matches. There are some places where one binding color spills over into the next, but for the most part, the plan worked! 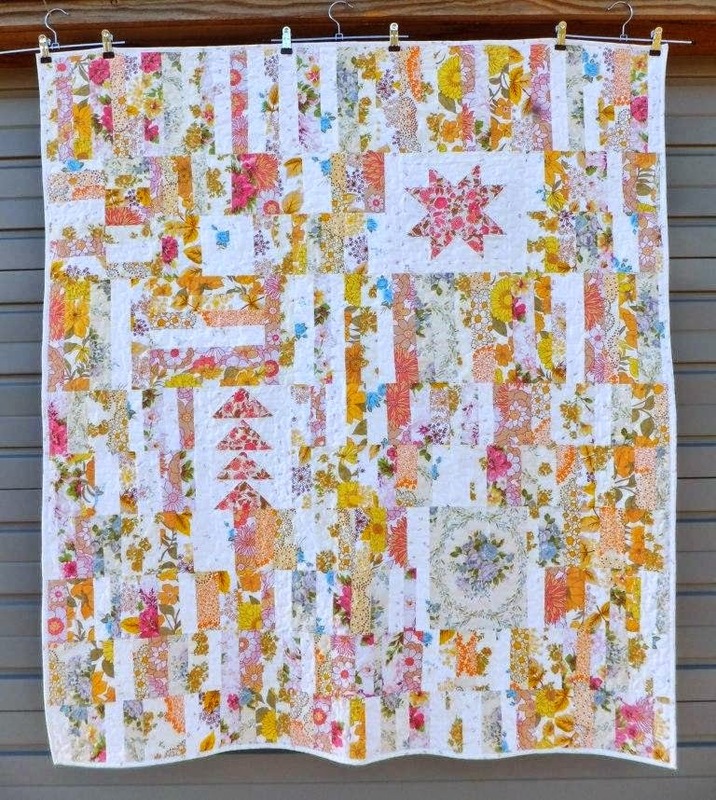 I just love scrappy quilts. Aside from the fact that they are so interesting to look at, they are so much fun to make. 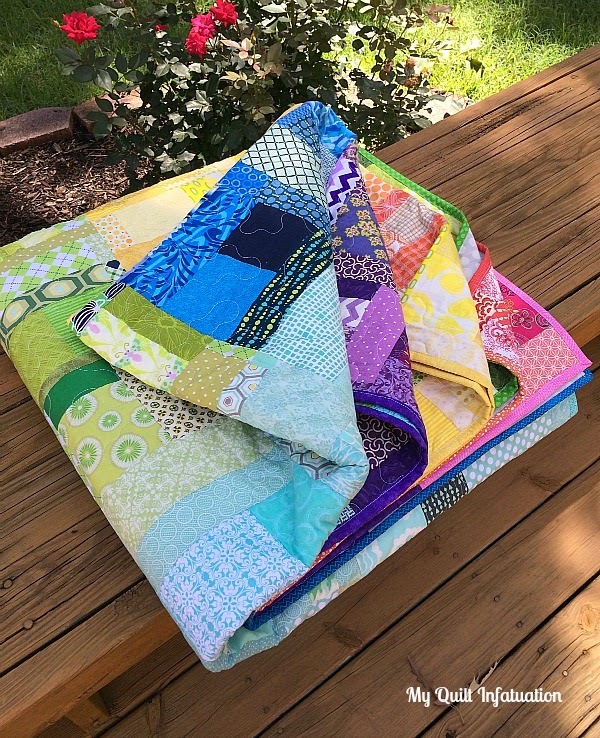 Sewing fabrics together and recalling each quilt that the scraps came from is a nice trip down memory lane!